As we reported several weeks ago, Spotify has been preparing to launch in Germany for some time: and, as expected, the service went live overnight on Monday. Germany — Western Europe’s largest internet market and strongest economy — is obviously a highly valuable target for the music service, yet its launch there trails nearly every other major market. So why so slow? The company has been selling the line that Spotify was significantly slowed by translation issues — but that is a crock. The service has been operating in the German language since at least November, when it launched in Austria. The reality is that Spotify has been stuck in painful negotiations with GEMA, Germany’s main music rights group, over how much it wants from the company for each song that gets played. 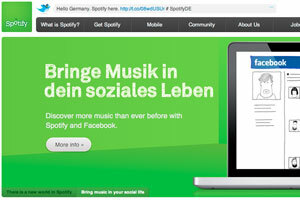 While Spotify may well try to cut deals with the major labels, who all have a stake in the company, GEMA has remained steadfast with notoriously high rates compared with other collection societies — Der Spiegel is reporting that its online streaming rates are €0.006 (about 0.7 cents), though documentation from January states that online services should pay a minimum of €0.01 (about 1.3 cents) for each play. That’s a pricing stance that has brought it into conflict with YouTube and even convinced Grooveshark to shut down German operations. It is not clear if Spotify, which is charging its standard tariffs of €4.99 and €9.99 to German users, negotiated a separate rate with GEMA. But it certainly seems possible, since the company is able to deploy its major label support and it has struck similar deals in other countries. Either way, it is publicly refusing to comment on its deal. And whether the timing — on the same day as Rdio’s scheduled revamp — is coincidental or not is unclear. Still, that doesn’t mean Spotify is going to find its entry uncontested. One major cause for concern could be the same thing that has propelled its users numbers skywards: Spotify’s mandatory integration with Facebook. The privacy implications already have some local consumers prickling, and given the social network’s travails in the German courts recently Spotify will be keen to prevent the same accusations being leveled at it. In fairness setting up in Germany is actually pretty complicated. Credit cards are not as common as they are in the US or UK and people prefer to pay by direct bank transfer or direct debit. If somebody does pay for your product by direct debit you have to hold onto the money for a minimum length of time as a security measure against fraudulent transactions..